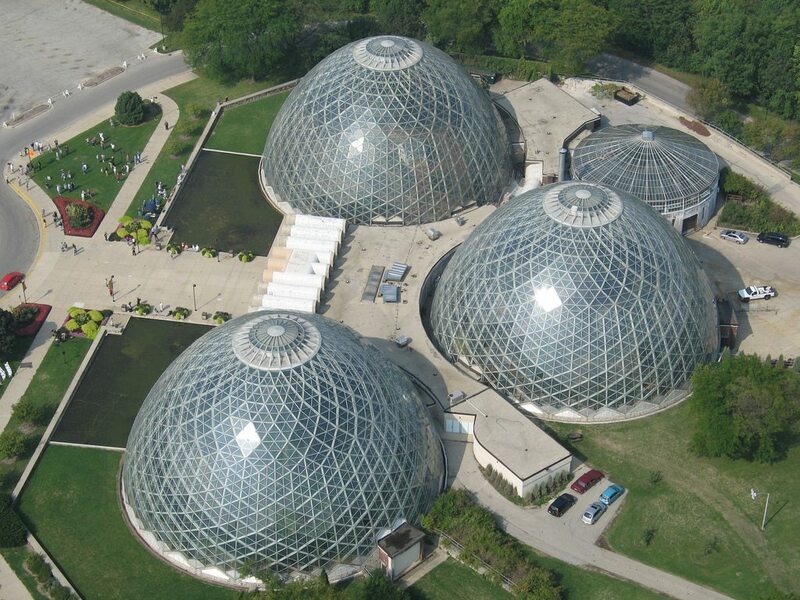 Can the Mitchell Park Domes Be Saved? Officially called the Mitchell Park Horticultural Conservatory, but popularly known simply as “The Domes,” the glass houses have been a center of community life and an international tourism destination for more than 50 years. In 1958, Milwaukee architect Donald L. Grieb won a national competition with his design for the Domes, which were constructed between 1959 and 1967. Their distinctive architecture features the world’s first “conoidal” – or cone-shaped – domes, which the Milwaukee Journal Sentinel has called “adventurous structures that remain unique in the world.” The Cultural Landscape Foundation, based in Washington, D.C., named the Domes an “at-risk cultural landscape” and compares their significance to St. Louis’s Gateway Arch, another “Modernist marvel. Despite the Domes’ significance and continued role in the community, the Domes remain threatened. Milwaukee County, which owns the complex, is considering demolition of one or more of the Domes, along with other options ranging from partial restoration to full reconstruction of the buildings. This situation also landed the Domes on the National Trust’s 2016 list of “America’s 11 Most Endangered Historic Places.” There has since been “a lot of response about the Domes” on the Trust’s website, including people signing a petition to save them, according to Jennifer Sandy, senior field officer for the Trust’s Chicago office. Reached by phone, Sandy said that support is by both those familiar with Domes and people “fascinated by their architecture” who now want to visit them. Sandy complimented county officials and the Domes task force for “engaging in a responsible process” to consider options for the Domes, including as part of Mitchell Park and the surrounding neighborhood. Also, a new report identifies a comprehensive rehabilitation approach for the Domes estimated at $18.6 million, around one-third the cost of the full rehabilitation options developed by GRAEF. The peer review of GRAEF’s repair proposals was prepared by Wiss, Janney, Elstner Associates (WJE), an engineering firm with decades of experience working on world-famous buildings including such high-profile projects as St. Louis’s Gateway Arch, the Metropolitan Museum of Art in New York, and the Washington Monument. WJE staff visited the facility and also reviewed all GRAEF’s architectural and engineering reports and letters about the Domes since 1994. The peer review analyzed GRAEF’s five proposed restoration options and one replacement in-kind option, which were cost-estimated from $14 to $64 million. Though WJE’s proposed repair would cost $18.6 million, $4.6 million more than GRAEF’s Option 1, the cost would be far less than GRAEF’s other proposed options, or what county officials roughly estimated might cost up to $75 million. WJE’s full report will be presented at the Domes Task Force meeting on Wednesday at 5:30 p.m. in the lobby of the Domes, 524 S. Layton Boulevard in Milwaukee. Time permitting, the public may be allowed to speak. Virginia Small is a Milwaukee freelance writer who has written for publications throughout the United States. The National Trust for Historic Preservation mobilizes its more than 60 years of expertise and resources to protect a growing portfolio of National Treasures that are threatened buildings, neighborhoods, communities, and landscapes that stand at risk across the country. The Trust’s National Treasures program demonstrates the value of preservation by taking direct action to protect these places and promote their history and significance. About Milwaukee Preservation Alliance, Inc. The Milwaukee Preservation Alliance is a nonprofit organization devoted to promoting stewardship and awareness of the historic, cultural, and economic value of Milwaukee’s built heritage. MPA aims to strengthen Milwaukee’s neighborhoods by advocating for and promoting unique cultural spaces and architectural assets to foster a strong and vibrant community, as well as demonstrating the link between historic preservation and viable economic development.